MANAGUA, Jul 10 2014 (IPS) - The spectre of famine is haunting Nicaragua. 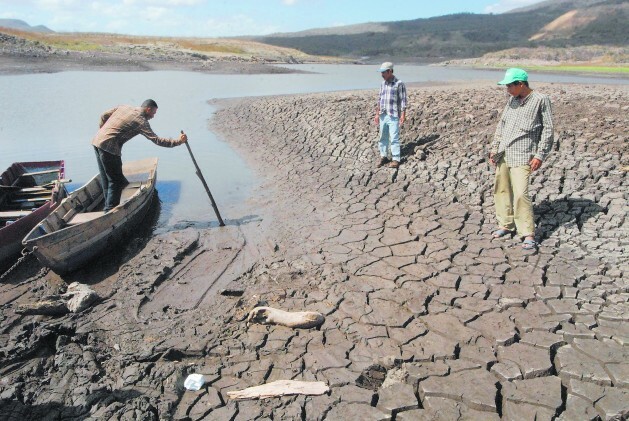 The second poorest country in Latin America, and one of the 10 most vulnerable to climate change in the world, is facing a meteorological phenomenon that threatens its food security. Scientists at the Nicaraguan Institute for Territorial Studies (INETER) say the situation is correlated with the El Niño Southern Oscillation (ENSO), a weather cycle that periodically causes drought on the western Pacific seaboard and the centre of the country, in contrast with seasonal flooding in the north and the eastern Caribbean coast. Polanco lost his bean crop due to lack of rain, but he remains hopeful. He borrowed 400 dollars to plant again in September, to try to recoup the investment lost by the failed harvest in May. The warm phase of ENSO happens when surface water temperatures increase in the eastern and central equatorial areas of the Pacific Ocean, altering weather patterns worldwide. Experts at the Humboldt Centre told IPS that in Nicaragua, the main effect is “a sharp reduction in available atmospheric humidity”, leading to “significant rainfall deficits” and an irregular, sporadic rainy season from May to October. Over the last 27 years there have been seven El Niño episodes, and each of them has been associated with drought, they said. “The last three rains have been miserable, not enough to really even wet the earth. It’s all lost and now I just have to see if I can plant in late August or September,” he told IPS with resignation. The nightmare is affecting all farmers on the Pacific coast and in the centre of the country. Sinforiano Cáceres, president of the National Federation of Cooperatives, a group of 300 large farming associations, expounded the sector’s fears to the inter-institutional National Board for Risk Management. “We have already lost the early planting (in May), and if we lose the late planting (in August and September) there will be famine in the land and a rising spiral of prices for all basic food products,” he told IPS at a forum of producers and experts seeking solutions to the crisis. There is a third crop cycle, in December, known as “apante”. “Thousands of small coffee farmers and thousands of families who depended on the crop have still not been able to recover their employment and income, and now El Niño is descending on them. I don’t know how the country will be able to recover,” he told IPS. “Producers do not know how to mitigate the effects of climate change, nor the mechanisms for adapting to soil changes. Unless the government implements policies for adaptation to climate change, there will be a severe food crisis in 2014 and 2015,” he told IPS. what makes you think the food won’t be stolen and sold for profit?